When Jerry told me I'd be getting this CD I thought those numbers meant a zip code (mine is 35055). And I really don't know who the players are because they aren't listed in the liner notes. What I do know is they're from the Netherlands and the music is very interesting. It has a great rockin' stoner style with spacey synths, not unlike Farflung or Pressurehed. The song "Soul Machine" defines the music with its heavy guitar rhythms and spacey keyboards. I was also impressed with "Undo", which has a heavy beat with metallic synths and great headbanging rhythms. This is probably the best song on the CD. "Vein" features acoustic guitar with psychedelic-spacey electric guitar. Plus they added a lot of percussion which gives the music a heavy sound. "66" is an awesome tune with thumping guitars and synth movements. This really rocks! "Locker" has a slow mellow drone, alternating between heavy and slow moments. 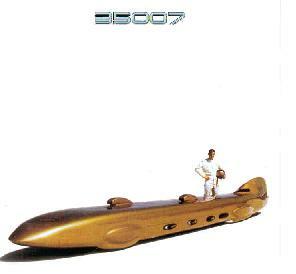 In summary, I wish I knew more about 35007 because these guys know the definition of space/stoner rock. Definitely worth a listen. You can visit 35007 at their web site.